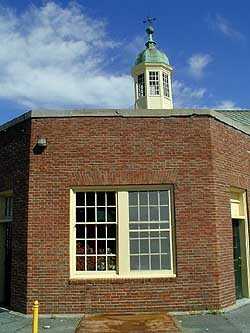 My first job was teaching history at a small and now closed independent school, the Woodstock Country School, in South Woodstock, Vermont. I didn't get in much train riding, but did have the opportunity to catch some nearby Boston and Maine, Central Vermont, and Canadian Pacific action in the White River Junction area -- much of which was on its last legs. I didn't return with a camera for 35 years. What I found was the same pretty town and classic station. 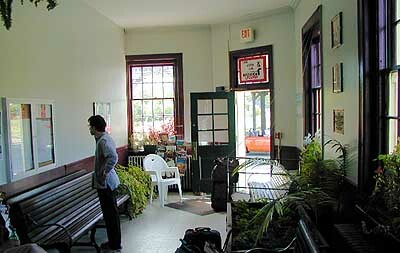 There was no longer service to Boston or to Montreal, but Amtrak' s state-supported Vermonter picked up a lot of people who enjoyed a sunny day, and chairs put out for them by an accomodating station manager. Boston and Maine #75, The Ambassador, from New York, Springfield and the Connecticut Valley arrives in White River Junction in the autumn of 1964, on its way to Montpelier Junction, St. Albans and Montreal. 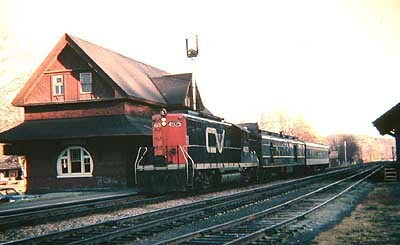 This day train was complemented by the overnight Washingtonian/Montrealer, which carried sleepers, a buffet lounge and coaches Washington through White River and on to Montreal. 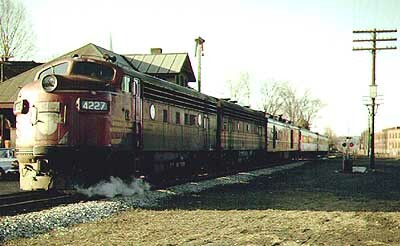 Here we can see the southbound Ambassador and RDC's which connected, on the left, Boston and White River Junction to Montreal on Candian Pacific tracks, which followed the Connecticut River up through Wells River, St. Johnsbury and Newport. Here's B&M RDC running ast CP #32 from Montreal though Thetford on its way to White River and Boston on a golden late autumn day in 1964. It would be gone forever in two months. Of all the railroad photos I've taken, this is my favorite. Another shot of #32 on its way to White River on the banks of the Connectict River. 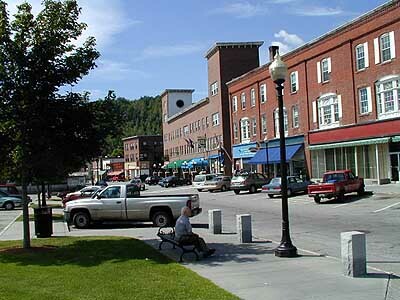 On the right is Ambassador cruising through Windsor, Vt., just south of White River. 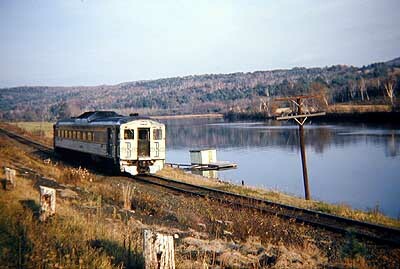 Now torn up B&M tracks between Concord and White River carried Boston RDC's through bucolic New Hampshire countryside and Potter Place, Enfield and other little towns on their way to Montreal in 1965, shortly before their discontinuance. 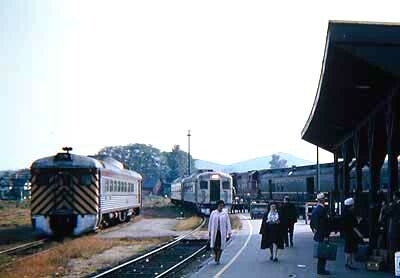 Here the Ambassador arrives in South Royalton, Vt., just a few miles up the line from White River Junction on Central Vermont Railway tracks. .
White River Junction still looks like it did in the 1960s, with the venerable Coolidge Hotel in the background. 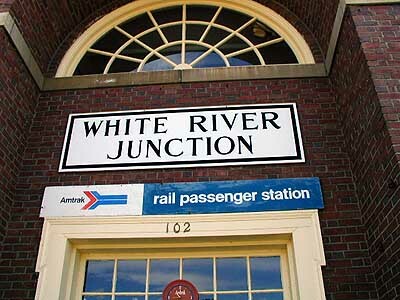 The White River station is a friendly place, filled with plants, memorabilia and train information. Lots of signs of community spirit and eager passengers boarding Amtrak's Vermonter. The joint really jumps in September, when White River hosts its railroad festival. Our final photos are from further down the line. The first shows Boston and Maine RDC's outside Boston's North Station in 1981. Service from Boston to White River Junction had ended long before that, but the scene reminds us of what the last days of that company's few runs to Northern New England looked like at their origin. 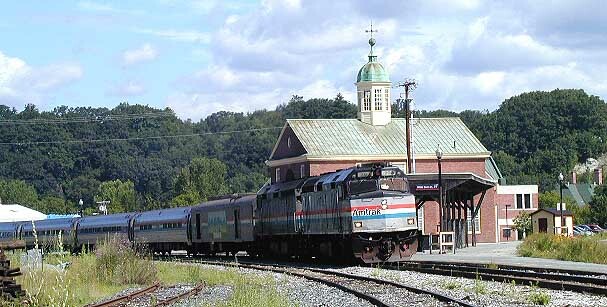 Finally a photo of the Vermonter taken in January 2005. 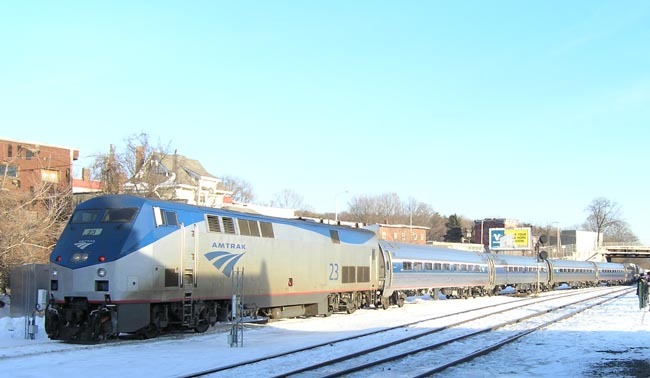 It was a frigid Sunday in Palmer, Massachusetts, and a hearty group of rail photographers had gathered at a favorite site for capturing Amtrak trains in Central Massachustts. The Vermonter pulls into Palmer (there is no station there) and then the engine on the rear takes over and heads the 'push-pull' train back out in the direction of Amherst and the Connecticut River Valley -- part of its Guildford-caused detour from Springfield, a detour that adds at least an hour to an already leisurely schedule. There's no longer a Boston and Maine Railroad (and much ot it is run by the anti-passenger Guildford, which lost its battle to further delay Downeaster service between Boston and Portland), the Central Vermont is no more, the Canadian Pacific carries freight only, and there is no longer service through Vermont to Canada -- bus connections only. 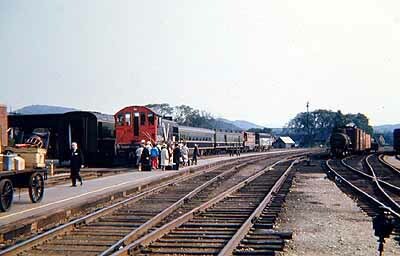 We caught the action of multiple trains arriving and departing from White River in their waning days. There is always talk of improving service, maybe opening the line between Boston and White River again. 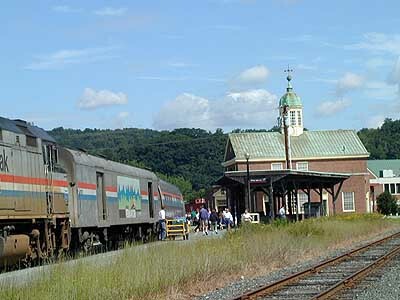 But the truth of the matter is that in these difficult times even the Vermonter is hanging on thanks to state subsidy, watching the quality of its service hacked away -- today the baggage car, used by skiiers and bike riders, and station agent are gone, what will it be tomorrow? This page was published initially in September 2002.